If you’re looking for an action cam that’s both full of features and economical, look no further than the 4K Ultra HD Action Cam. Like other action cams, this one is capable of capturing 4K high definition video. Unlike those others, it’s on sale for just $69.99, so you’ll get far more bang for your buck. There’s a lot of action cams on the market. Though they have their differences, one commonality tends to be a hefty price tag. And then, if you want to outfit it with mounting hardware, you’ll have to be prepared to shell out even more. That is where the 4K Ultra HD Action Cam sets itself apart from the pack. It offers the same high-quality features as competitor models, yet it costs a fraction of the price — and it even includes all the mounting hardware. 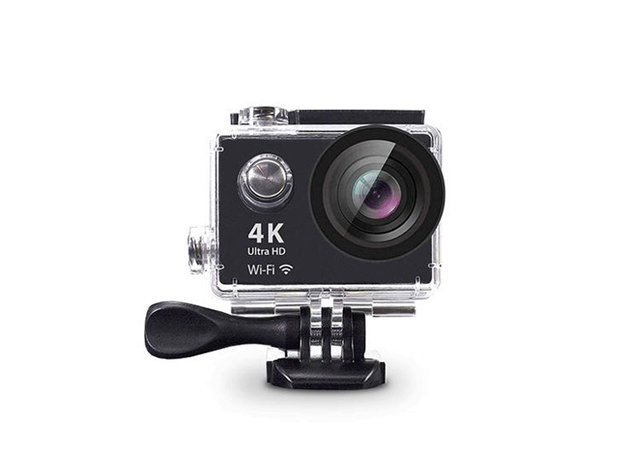 The 4K Ultra HD Action Cam can shoot 4K video at 25 frames per second, 1080p at 60fps, and 720p at 120fps. It comes with a wireless remote control, features built-in Wi-Fi connectivity, and the included waterproof casing will keep your camera bone dry to depths of 98 ft. It comes with everything you’ll need to get started, including a variety of mounts, and you can download a free app for your Android or iOS mobile device so you can control it on the go. If you’re in the market for an action cam, get the one that offers more for less. The 4K Ultra HD Action Cam has been discounted to just $69.99 — a savings of 22% off the MSRP of $89.99 — but will only be available at this price for a short time.